Gah, that ring, I love it! Kelly green, perfection. I don’t wear a lot of green, but that sweater is awesome! Kelly green is one of those colours that really draws my eye when i walk into a shop. When i got my first Cambridge satchel i chose this shade because although i wanted ALL the colours, choosing green was the easiest. Its like fresh grass and looks so great with crisp white and soft grey. That print from J Crew is awesome. Also love the pants they made with it. There is something so happy about kelly green. It is definitely one of my favorite colors for both fashion and decor. Sometimes a bit of green in exactly what you need 🙂 It’s always unexpected, in my opinion. Love the color kelly green, and that sweater is perfect inspiration! Such a fashionable and sophisticated color! Those sunnies are amazing! Great picks. those shoes are something special! 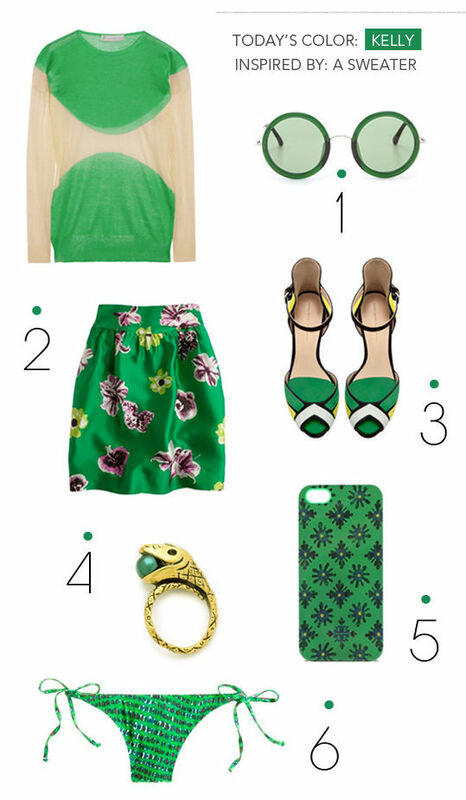 That ‘punk floral’ skirt… I’m obsessed. Isn’t kelly green the happiest shade?! So glad you a featuring Kelly green. My agent always tell me that green prints don’t sell. I love green and feel it looks great on all skin tones. I guess I need to sell my prints to J Crew. He he! ah, thanks for this. green is my favorite color! I’m in love with that green sweater! I love those green shoes! They are so cute. The best green I ever seen! Those shoes! They are amazing. The sunnies are cute too!